Alcatraz is one of San Francisco’s most popular must-see attractions and tours sell out quickly. On this exclusive tour, you’ll beat the crowds and board one of the first ferries to Alcatraz Island for priority entry to this historic prison that was once home to some of the nation’s most notorious criminals (Al Capone, The Birdman and Machine Gun Kelly). The tour begins with a scenic ferry ride across the bay where you’ll see stunning views of the Golden Gate Bridge, Bay Bridge and Angel Island. The self-guided Alcatraz audio tour is fantastic – hear actual voices of the guards and inmates who lived on the island as they recall what life “inside” was like years ago. Explore San Francisco, including Chinatown and North Beach – and ride over the Golden Gate Bridge in a converted cable car, stopping on the other side at Vista Point to take pictures and admire the panoramic views. Enjoy a boxed lunch from Boudin Bakery (famous for their sourdough bread) aboard the cable car. Your tour ends with a scenic ride back to Union Square, (the Bay Area’s premier shopping destination) where you can shop at your leisure or just chill out and people-watch. San Francisco is a foodie’s paradise and now you can experience it as a local. The Ferry Plaza Farmers Market is one of our favorite places to hang out (and the place to be) on a Saturday morning as thousands of shoppers flock here to browse the stalls filled with everything from artisan breads, cheeses and jams to organic produce, olive oils and fresh flowers. Bring an appetite and get ready to experience San Francisco as a local. During this fun 2-hour guided food tour, enjoy tasting a selection of organic cheeses, sourdough bread, freshly made mortadella and house cured fennel salami, fruit and vegetables, pickled veggies – and fabulous desserts, including French macaroons and chocolates. I’m getting hungry just writing about it! Note: A smaller version of the Farmers Market runs on Tuesdays. Book up early – this is a very popular food tour, especially on Saturdays. See all the top city attractions – hop on and off the bus at your leisure at up to 17 San Francisco stops. We always recommend taking this Hop-on Hop-off Double-Decker Bus Tour when you first arrive in San Francisco to get a lay of the land. it’s a perfect way to get around the city and see all the top attractions and then go back to the ones you want to spend more time visiting. Hop on and off the bus at your own pace – stops include Fisherman’s Wharf, Pier 39, Chinatown, Ghirardelli Square, North Beach, Union Square, Golden Gate Park, Palace of Fine Arts, Haight Ashbury, Lombard Street… and more! Tour also includes live narration from friendly, knowledgable guides and free WiFi. Choose from a 1 or 2-day City Loop Pass or a 1-day Sausalito Loop Pass. Or upgrade to the 2-day All Loops Pass that includes a Trolley Tour across the Golden Gate Bridge and a City Night Tour. Visit the only place in the world with an aquarium, a planetarium, a natural history museum and a stunning 4-story rainforest all under one roof! No need to wait in long lines to get into the popular California Academy of Sciences museum, located in the heart of Golden Gate Park. Skip the Line ticket gives you easy, fast access and includes all shows and exhibits. The Aquarium is home to almost 40,000 live animals and the word’s deepest living coral reef exhibit, featuring over 900 different species. Feel like an astronaut – catch one of the shows at the world’s largest all-digital Planetarium. Visit the stunning three-story glass-domed living Rainforest, one of the Academy’s highlights – it’s our favorite area of the museum. Follow the dome’s spiraling 28-ft walkway through three separate rainforest galleries containing 1,600 live animals, including free-flying birds, exotic reptiles, bats, and magnificent butterflies (look out for the giant aqua Blue Morpho (pictured at top) – it’s one of the most beautiful butterflies we’ve ever seen). Visit the Swamp area and say hi to the aquarium’s rare white albino alligator. Check on scheduled times for the Coral Reef Dives and Penguin Feedings – both are fascinating to watch. Plan on spending plenty of time here because there’s so much to see – it’s a fun place for kids and big kids too! Cruise the bay at sunset and see amazing views of the San Francisco skyline and waterfront, Alcatraz, Angel Island and Sausalito – and sail under the Golden Gate Bridge and Bay Bridge. Relax on a romantic and leisurely 2-hour narrated sunset cruise. Enjoy a tasty appetizer buffet, cocktail and background music as you cruise along the picturesque waters of San Francisco Bay. A full bar is also available during the cruise to purchase additional beverages and cocktails. Being on the water is a perfect way to unwind and see some of the city’s top attractions – it’s great for picture-taking too! Dress in layers – it can get chilly if the fog rolls in. (Note: Sunset Cruise takes place late March thru’ early November; Twilight Cruise sails during the winter months). Enjoy a fun day of wine-tasting in Napa Valley and Sonoma Wine Country as you travel by luxury air-conditioned coach (with free WiFi) from San Francisco – no need to worry about drinking and driving! Along the way, your expert guide will fill you in on the history of winemaking. The tour includes guided tours and wine-tastings at a mix of three acclaimed boutique and large-scale wineries. Stroll through picturesque vineyards and see how the grapes are picked, crushed, blended and bottled – before sampling wines in the tasting room (all tasting fees are included in the tour). Explore the charming town of Yountville (known as the “Culinary Capital of the Valley”) – it’s one of our favorite places to stay when visiting Napa Valley. Enjoy lunch and shopping at your leisure. Grab a quick bite at Bouchon Bakery or Pacific Blues Cafe (both offer outdoor seating) and walk around V Marketplace 1870 – it’s filled with speciality shops, art galleries, a wine cellar, cafes and restaurants. Wine lovers won’t want to miss this fun, informative and educational Napa and Sonoma Wine Country tour. Experience California’s spectacular coastline on this fun one-day trip to Monterey and Carmel. Take in breathtaking sights as you drive along Highway 1 to beautiful Monterey Bay. Explore Monterey and Steinbeck’s historic Cannery Row – shop, have lunch and stroll along the wharf at your leisure. You’ll have the option of visiting the iconic Monterey Bay Aquarium – one of the best and largest aquariums in the world. It’s worth it just to see their amazing Jellyfish exhibit. This fun day trip includes a drive along the famous 17-Mile Drive – the scenic coastal route hugs the rocky coastline between Carmel and Pacific Grove, offering some of the best views on the planet. See the famous Lone Cypress Tree (pictured at top), Pebble Beach Lodge and Golf Course, and Seal Rock. You’ll have plenty of picture-taking opportunities along the drive. The tour ends with a stop at Carmel-by-the-Sea, one of California’s most charming and romantic cities. Walk along the picturesque white-sandy beach (there’s also a great windy walking path on Scenic Road with magnificent ocean views on one side and fabulous beachfront homes on the other) or enjoy shopping along Ocean Avenue. Carmel’s little side streets, secluded courtyards and alleyways are crammed with quaint specialty shops, fine jewelry stores, trendy boutiques, upscale art galleries and cozy coffee shops. San Francisco’s Chinatown is one of the oldest and largest in the nation – and it’s also one of the most visited. Chinatown’s streets and alleyways are jam-packed with little shops and stalls, specialty stores, food and fish markets, herbal shops, antique stores, temples, bakeries, dim sum parlors and exotic Chinese restaurants. On this fun walking tour, learn about the cultural side of San Francisco – where the old world meets the new. Your guide will take you to some of Chinatown’s most popular sights, as well as a few off-the-beaten path spots, including an alley full of temples, private clubs and covert societies. Visit an authentic Buddhist temple. Pop into a herbal pharmacy and discover the secrets of ginseng root (for longevity), pearl pills (for beautiful skin) and gecko lizards (for energy). Stop by the famous Golden Gate Fortune Cookie Factory to see how fortune cookies are made – it’s a fascinating process. On your way out, taste one of their thin crispy cookies – they’re so good. If you want to take pictures, there’s a small fee (last time we were there it was about 50 cents). You can also buy bags of different flavored fortune cookies (plain, almond, chocolate) to take home with you or give as a gift. Upgrade your tour to enjoy a scrumptious 10-course dim sum lunch – go with an appetite! Combine two popular destinations in one on this fun Super Saver tour to Muir Woods and Northern California Wine Country. Visit Muir Woods (named after conservationist John Muir) and walk among the majestic thousand-year-old giant Redwood Sequoia trees, towering over 250 feet high (see picture at top). The scenic park includes six miles of hiking trails, each with different levels of difficulty, so take your choice. Next stop… Wine Country! Spend a leisurely afternoon wine-tasting as you tour three boutique wineries in Napa and Sonoma County (all wine-tasting fees included). In between wineries, you’ll have an hour to yourself to explore historic Sonoma Plaza, grab lunch, go shopping, or visit local tasting rooms. Plan on spending up to an hour at each selected winery. Sit back, relax and enjoy the scenery along the way as you travel through the Sierra Nevada mountain range and old Gold Rush towns to Yosemite Valley, home of the famed Half Dome and El Capitan. Stop at Inspiration Point to admire breathtaking views of the valley and take pictures of one of the world’s most spectacular natural settings – there are almost no words to describe such beauty. Tour includes a guided hike to see the Giant Sequoias (weather permitting) – you won’t believe how big these trees are; be sure to take a picture standing inside of one. You’ll also have plenty of free time to explore the park at your leisure. Hike to one of Yosemite’s spectacular waterfalls (amount of water varies throughout the year). As of this writing, the California drought has taken its toll so the waterfalls may be scarce. Rent a bike and cycle through the valley, take a dip in a river pool (it’s cold, so be prepared), or visit the amazing Ansel Adams Gallery… there’s plenty to keep you busy for hours on end. Note: The best time to visit Yosemite’s Giant Sequoias are during May and October when the weather is more suitable. 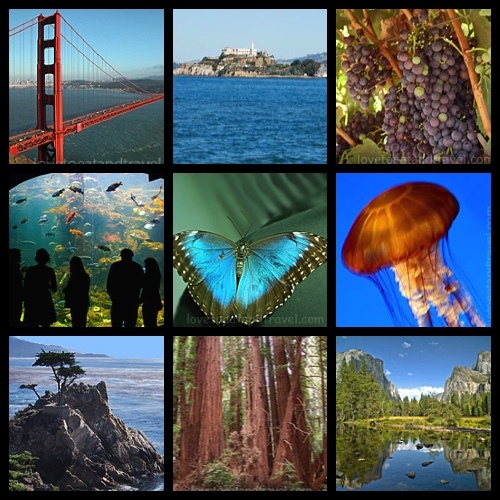 We’d love to hear about your San Francisco Bay Area travel experiences. What are some of your favorite destinations and sightseeing tours? Thanks for sharing with your readers. Enjoy this great weather!